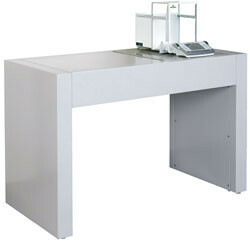 Weight tables are self-supporting structure made of sheet steel with an integrated independent weight plates frame. Weight plate of a large mass made of granite and is based on high-performance vibration dampers. In the table configuration there is no electric unit. To connect the scale use wall outlet. *CA-G800 - an anti-vibration table has a weight plate weighing 70 kg, designed for installation of equipment requiring operating conditions to eliminate vibration effects.